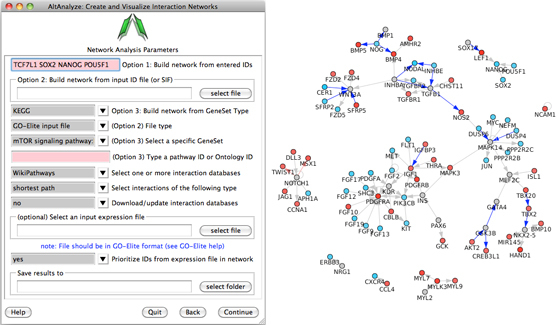 NetPerspective is a new tool in AltAnalyze designed to visualize biological interactions between gene, proteins, RNAs, metabolites and drugs in a coherent and easy way. Highly validated protein and metabolite interactions from annotated pathways (WikiPathways, KEGG, HMDB). Experimentally derived protein-protein or protein-DNA interactions (BioGRID, Amadeus, Pazar). User supplied gene/metabolite ID files (e.g., AltAnalyze/GO-Elite produced). Existing interaction tables (e.g., SIF format). Nodes indirectly connecting through other genes/metabolites. The shortest possible path between two or more genes/metabolites. When loaded with a differential expression file in the AltAnalyze produced GO-Elite input file format, nodes will be colored as red or blue, depending on their assigned numerical value (positive or negative column #3). Additionally, IDs specifically in the input file can be used to augment a network (e.g., regulated protein expression in a metabolite network). NetPerspective can be run independent of the standard AltAnalyze workflows. To run, simply start AltAnalyze, select the appropriate species and ANY platform/vendor type (ignored for NetPerspective) and continue to the main analysis window. When presented, selected "Additional Analyses" then "Network Analysis". The above interface will be presented. Here you can select various options as outlined in the previous section. When providing a list of IDs, versus existing interactions, the input file type will need to be specified (option 2).